411 in stock Need More ? Reprint. Film tie-in. Originally published: as The lightning thief. New York: Hyperion Books for Children, 2005. 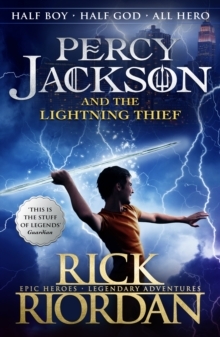 Percy Jackson and the Lightning Thief is the first bestselling book in Rick Riordan's phenomenally successful Percy Jackson series. Half boy. Half God. ALL Hero. Look, I didn't want to be a half-blood. I never asked to be the son of a Greek God. I was just a normal kid, going to school, playing basketball, skateboarding. The usual. Until I accidentally vaporized my maths teacher. Now I spend my time battling monsters and generally trying to stay alive. This is the one where Zeus, God of the Sky, thinks I've stolen his lightning bolt - and making Zeus angry is a very bad idea. -----Rick Riordan has now sold an incredible 55 million copies of his books worldwide 'It's Buffy meets Artemis Fowl.